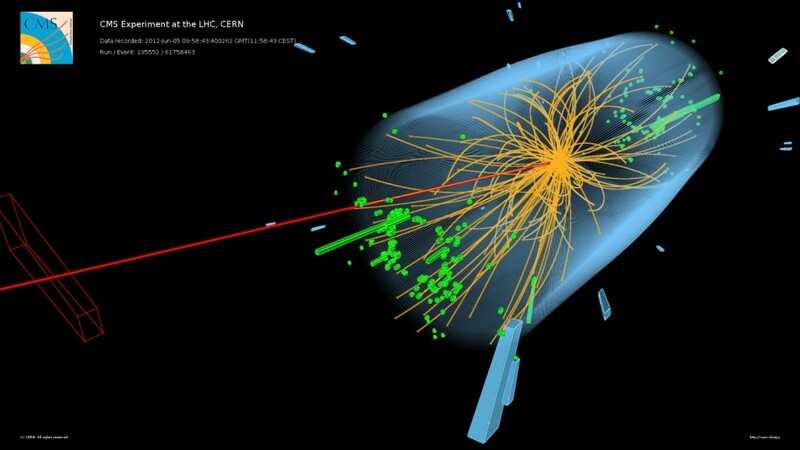 Updated Friday, January 31, 2014: Candidate event of Higgs boson decaying to bottom quarks has been added at the bottom. 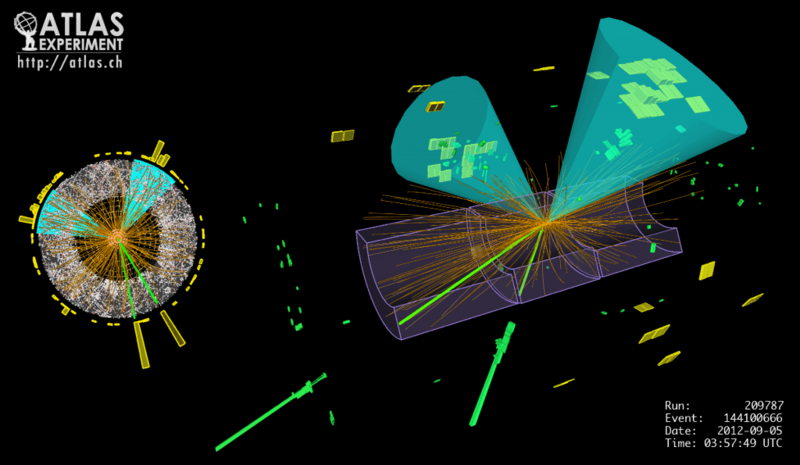 CMS has announced direct evidence of the Higgs coupling to bottom quarks. This is special. Last week, the Compact Muon Solenoid Experiment, one of the two general purpose experiments at the CERN Large Hadron Collider (LHC), submitted two papers to the arXiv. The first claims the first evidence for the Higgs boson decaying directly to tau lepton pairs and the second summarizes the evidence for the Higgs boson decaying directly to bottom quarks and tau leptons. (As an aside: The summary paper is targeted for Nature Physics, so it is shorter and more broadly accessible than other ATLAS and CMS publications.) These results are special, and why they are important is the topic of today’s post. For more information about the evidence was obtained, CERN posted a nice QD post last month. Fig 1. Event display of a candidate Higgs boson decaying into a tau lepton and anti-tau lepton in the ATLAS detector. 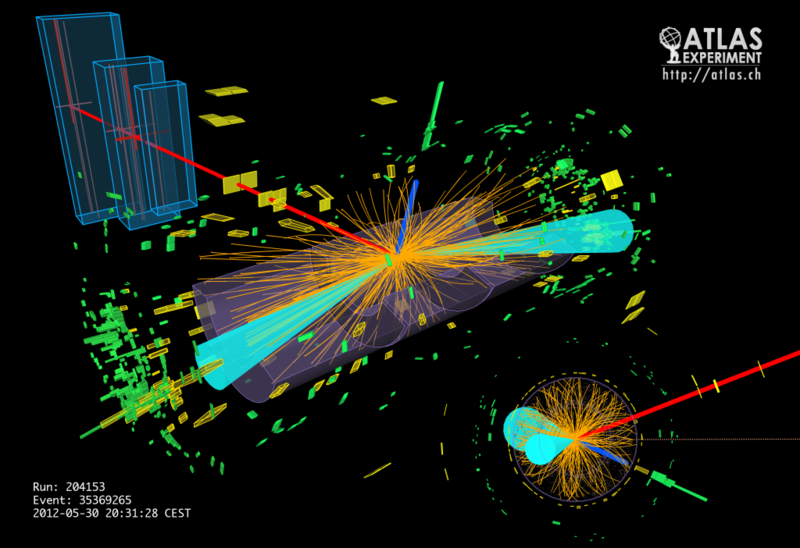 There is a litany of results from ATLAS and CMS regarding the measured properties of the Higgs boson. However, these previous observations rely on the Higgs decaying to photons, Z bosons, or W bosons, as well as the Higgs being produced from annihilating gluons or being radiated off a W or Z. Though the top quark does contribute to the Higgs-photon and Higgs-gluon interactions, none of these previous measurements directly probe how fermions (i.e., quarks and leptons) interact with the Higgs boson. Until now, suggestions that the Higgs boson couples to fermions (i) proportionally to their masses and (ii) that the couplings possess no other scaling factor were untested hypotheses. In fact, this second hypothesis remains untested. Fig. 2: Event display of a candidate Higgs boson decaying into a tau lepton and anti-tau lepton in the CMS detector. As it stands, CMS claims “strong evidence for the direct coupling of the 125 GeV Higgs boson” to bottom quarks and tau leptons. ATLAS has comparable evidence but only for tau leptons. The CMS experiment’s statistical significance of the signal versus the “no Higgs-to-fermion couplings” hypothesis is 3.8 standard deviations, so no rigorous discovery yet (5 standard deviations is required). For ATLAS, it is 4.1 standard deviations. The collaborations still need to collect more data to satisfactorily validate such an incredible claim. However, this should not detract from that fact that we are witnessing phenomena never before seen in nature. This is new physics as far as I am concerned, and both ATLAS and CMS should be congratulated on discovering it. Fig. 3: Event display of a candidate Higgs boson decaying into a bottom quark and anti-bottom quark in the ATLAS detector. HT to Jon Butterworth for the link. Once enough data has been collected to firmly and undoubtedly demonstrate that quarks and leptons directly interact with the Higgs, the real tests of the Standard Model of particle physics start up. In the Standard Model, the strength at which a fermion interacts with the Higgs is proportional to the fermion mass and inversely proportional to the ground state energy of the Higgs field. There is no other factor involved. This is definitively not the case for a plethora of new physics models, including scenarios with multiple Higgs bosons, like supersymmetry, as well as scenarios with new, heavy fermions (heavy bottom quark and tau lepton partners). This is definitely a case of using newly discovered physics to find more new physics. PS I was unable to find an event display of a Higgs boson candidate decaying into a pair of bottom quarks. If anyone knows where I can find one, I would be very grateful. PSS Much gratitude toward Jon Butterworth for providing a link to Higgs-bbar candidate events.